I hang you above my doorstep and in the light of my windows, a perfect little orb of blown glass, glittering in the sun, reflecting bad energy back on itself. You chase away evil, your history suggests, luring in witches with your beauty and sucking them inside your smooth shell; they are trapped, like a bug come too close to a flame. They can harm no one. I keep you on my writing desk, ready to peer into your opaque gaze, searching for a glimpse of my future, a peek at another world. Divination, the true purpose of the witching ball. But I wonder if the truth isn't somewhere in the middle, depending on the story, depending on the witch. Perhaps these glass orbs do deflect darkness; perhaps they trap it within them, containing the powerful magic of a wayward soul--and it is this soul, this magic, that reveals the images you so desperately search for on the surface of the misty glass ball. Perhaps a witch uses it on humans, to ward away their fear and superstition, to protect her home from those afraid of the unseen forces that guide our lives. 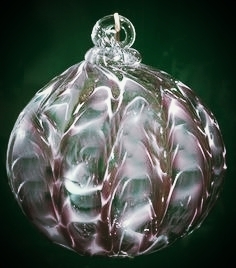 Perhaps it is just a glass ball, like any other trinket or ornament--though I doubt it. All I can say for sure is that when I see them stacked haphazardly in a dusty box or hanging on display windows in antique stores, now nothing more than used up superstitions, I can't help but wonder as I watch the dust float and drift over their surfaces, forming vague shapes. I can't help but think be careful: don't mishandle them, don't break the glass. Who knows what might come out of it.